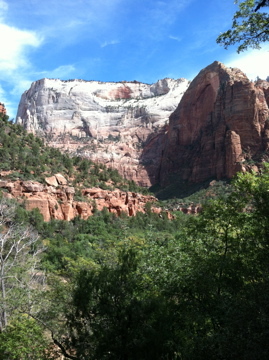 Zion National Park is that stupid and I’m feeling clubbed by beauty. “It’s majestical,” a young man said to me today at the head of Hidden Canyon and he was completely right. 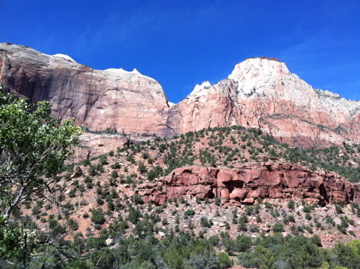 As you travel down Pine Creek Canyon coming into the main part of the park from the east, or ride up Zion Canyon, spires of light gray rock come into view from behind massive, sculpted towers of red sandstone, and then in the distance a white mesa topped with green pine draws a line across the horizon. 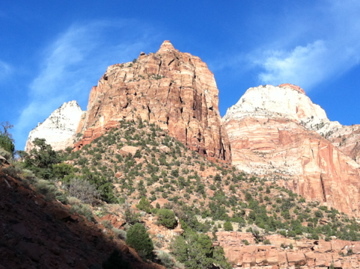 David and I have seen a lot of spectacular in the last few days, but Zion National Park takes it to a whole other level. Getting to Hidden Canyon was a triumph for me. 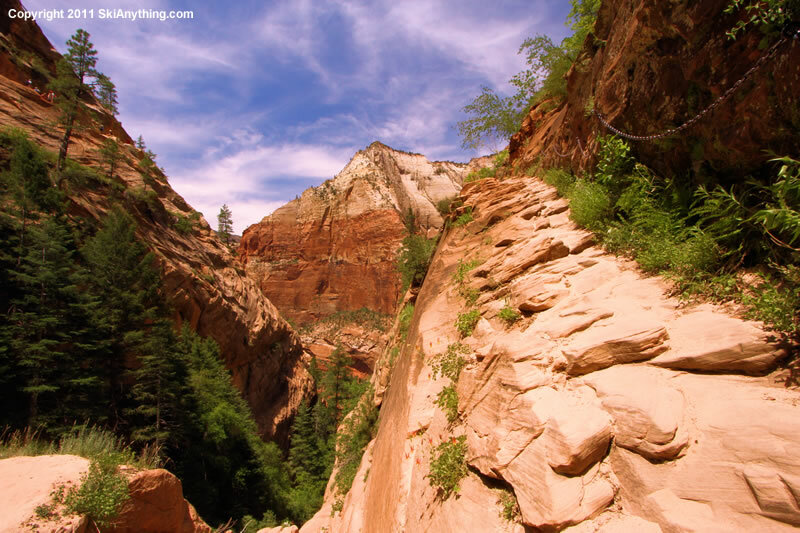 Zion is known for having very steep drop offs along the edges of some hiking trails, and this was one. The trail description makes it clear that it’s not appropriate for people afraid of heights. That would be me to some extent, so we decided to do the trail and see just how afraid I was. At one point I had to sit down and think about whether I could keep going. A nice young couple was coming down the trail and assured me there were good chains to grab ahead. I grabbed and kept going. And made it. I was rewarded with incredible views. The photo below, with the chains hugging the rock wall to the right, is not by me. There was no way I was stopping to take out my phone and take a picture. Tomorrow we’re going back to hike up to one of the highest spots in the park, Observation Point. Then we’re heading back down to hike The Narrows along the floor of the canyon. 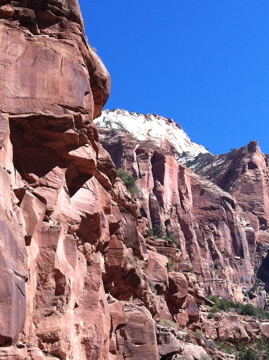 Not a trail, the Virgin River, with canyon walls reaching up thousands of feet on either side of us. This is a hike where getting your feet wet is part of the trip.